, an English writer of uncommon parts and learning, and very celebrated in his day, was born at Partney, near Spilsbye in Lincolnshire, Feb. 28, 1631. His father was a minister, and lived at Spilsbye; but being inclined to be an anabaptist, and forced to leave that place, he went with his wife and children into Ireland. 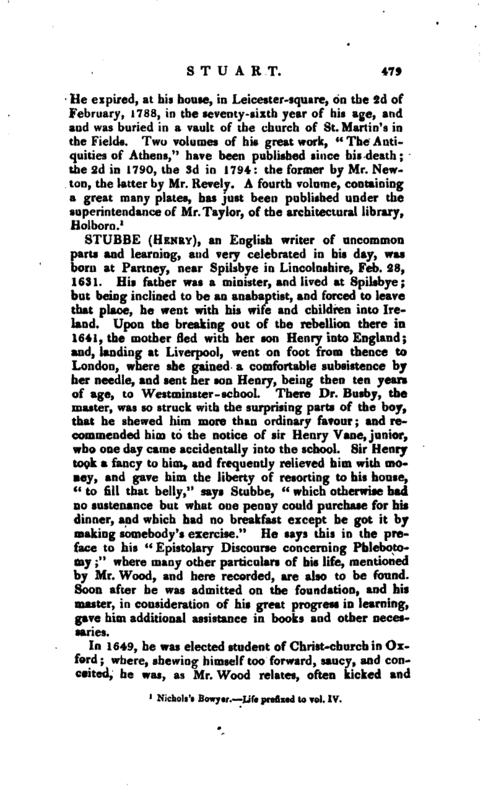 Upon the breaking out of the rebellion there in 1641, the mother fled with her son Henry into England; and, landing at Liverpool, went on foot from thence to London, where she gained a comfortable subsistence by her needle, and sent her son Henry, being then ten years of age, to Westminster- school. There Dr. Busby, the master, was so struck with the surprising parts of the boy, that he shewed him more than ordinary favour; and recommended him to the notice of sir Henry Vane, junior, who one day came accidentally into the school. Sir Henry took a fancy to him, and frequently relieved him with money, and gave him the liberty of resorting to his house, “to fill that belly,” says Stubbe, “which otherwise had no sustenance but what one penny could purchase for his dinner, and which had no breakfast except he got it by making somebody’s exercise.” He says this in the preface to his “Epistolary Discourse concerning Phlebotomy;” where many other particulars of his life, mentioned by Mr. Wood, and here recorded, are also to be found. Soon after he was admitted on the foundation, and his master, in consideration of his great progress in learning, gave him additional assistance in books and other necessaries. 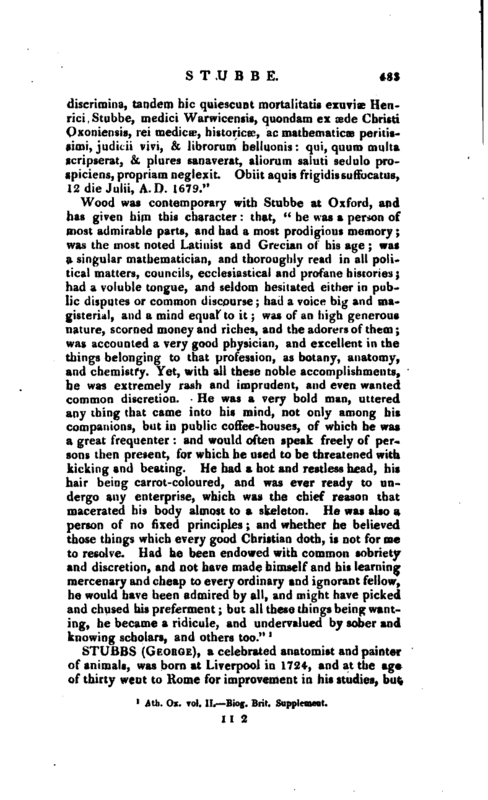 In 1649, he was elected student of Christ-church in Oxford; where, shewing himself too forward, saucy, and conceited, he was, as Mr. Wood relates, often kicked and | beaten. 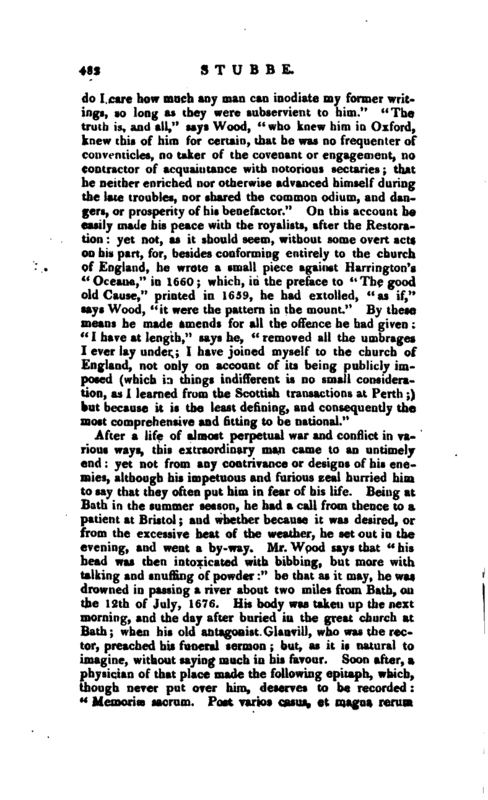 However, through the interest of his patron, he was certainly of no small consequence; for the oath, called the Engagement, being framed by the parliament that same year, was some time after sent down to the university by him; and he procured some to be turned out, and others to be spared, according as he was influenced by affection or dislike. While he continued an under-graduate, it was usual with him to discourse in the public schools very fluently in Greek, which conveys no small idea of his learning. After he had taken a bachelor of arts degree, he went into Scotland, and served in the parliament army there from 1653 to 1655: then he returned to Oxford, and took a master’s degree in 1656; and, at the motion of Dr. Owen, was in 1657 made second-keeper of the Bodleian library, under Dr. Barlow. He made great use and advantage of this post for the assistance of his studies, and held it till 1659; when he was removed from it, as well as from his place of student of Christ church; for he published the same year, “A Vindication” of his patron sir Henry Vane; “An Essay on the good Old Cause;” and a piece, entitled “Light shining out of Darkness, with an Apology for the Quakers,” in which he reflected upon the clergy and the universities. 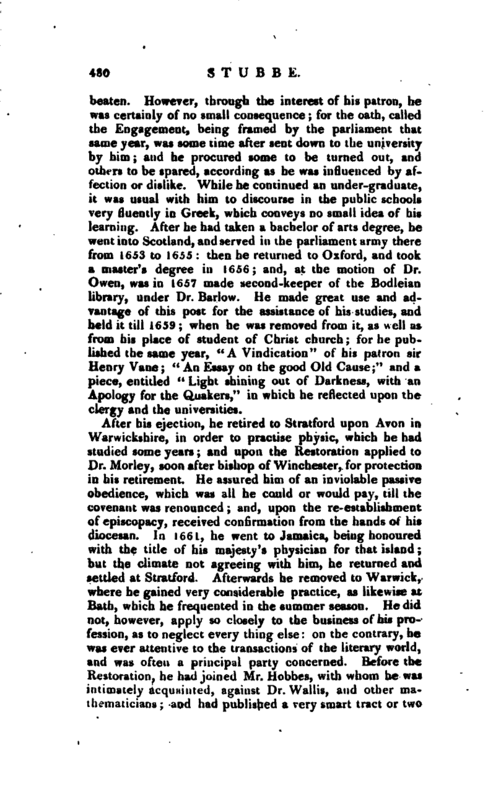 After his ejection, he retired to Stratford upon Avon in Warwickshire, in order to practise physic, which he had studied some years; and upon the Restoration applied to Dr. Morley, soon after bishop of Winchester, for protection in his retirement. He assured him of an inviolable passive obedience, which was all he could or would pay, till the covenant was renounced; and, upon the re-establishment of episcopacy, received confirmation from the hands of his diocesan. In 1661, he went to Jamaica, being honoured with the title of his majesty’s physician for that island; but the climate not agreeing with him, he returned and settled at Stratford. Afterwards he removed to Warwick, where he gained very considerable practice, as likewise at Bath, which he frequented in the summer season. He did not, however, apply so closely to the business of his profession, as to neglect every thing else: on the contrary, he was ever attentive to the transactions of the literary world, and was often a principal party concerned. Before the Restoration, he had joined Mr. Hobbes, with whom he was intimately acquainted, against Dr. Wallis, and other mathematicians; and had published a very smart tract or two | in that controversy, in which he was regarded as second to Hobbes. After the. 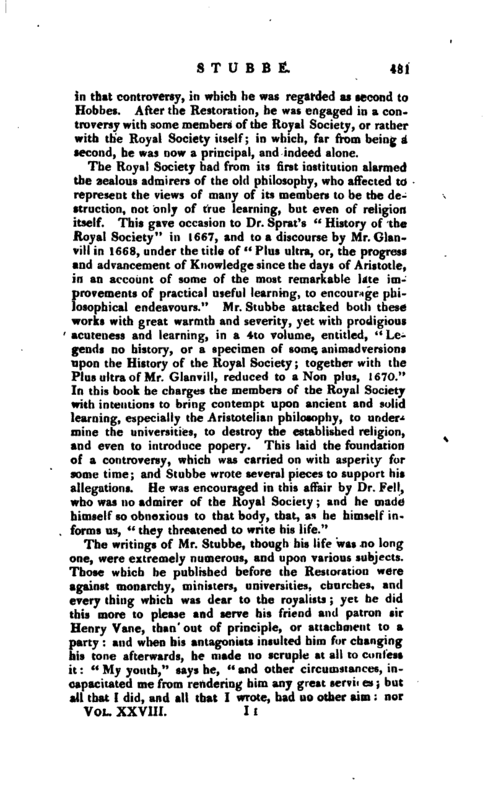 Restoration, he was engaged in a controversy with some members of the Royal Society, or rather with the Royal Society itself; in which, far from being a second, he was now a principal, and indeed alone. Ath. Ox. vol. II.—Biog. Brit. Supplement.